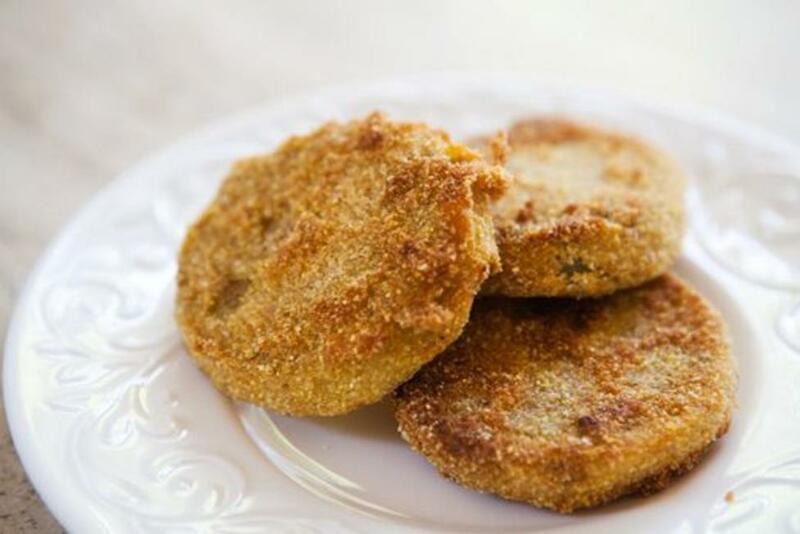 Traditional fried green tomatoes are a special treat when you just can’t wait for your tomatoes to ripen. This simple recipe includes slicing firm green tomatoes, dipping them in flour, egg, then a mixture of cornmeal and bread crumbs and fried to a light golden brown. If you can find it, use fine white cornmeal, and don’t substitute the buttermilk as it adds flavor and tang! Cut unpeeled tomatoes into 1/2 inch slices. Sprinkle slices with salt. Let tomato slices stand for 5 minutes. Meanwhile, place in separate shallow bowls: the flour and Cajun seasoning (if using), buttermilk and egg, and bread crumbs and cornmeal. Heat the peanut oil in a skillet on medium heat. Beat the egg and the buttermilk together. Dip tomato slices in the flour-seasoning mix, then buttermilk-egg mixture, then the cornmeal-bread crumb mix. In the skillet, fry half of the coated tomato slices at a time, for 3-5 minutes on each side or until brown. Set the cooked tomatoes on paper towels to drain. These are fantastic with a Remoulade sauce. Yield: Serves 4 as a side dish. This sauce is also great with crab cakes, or serve with baked or fried fish fillets. Combine all ingredients. Refrigerate for at least 1 hour to blend flavors and chill.